The DFRobot RP5 Mobile Tank Base is the perfect low-cost tank base to help you build your mobile robot. The two DC motors included with the platform can be powered with 6 AA batteries (not included) or your own power system. This is a top selling crawler chassis, suitable for DIY robotics. The RP5 utilizes a caterpillar drive. The chassis is constructed from two symmetrical trays. Both of the motors and the spur gear transmissions are integrated therein. The wheel axles and drive shafts are supported in sintered bearings. The drives are industrial grade motors, featuring high lifetime and an excellent efficiency. This will ensure long operating periods with fully charged batteries. Two fork light barriers at the lower side of the Robot mainboard embrace the combined gears and enable a precise distance measurement by way of small drill holes. The rubber-made tracks are driven by wheels, 44 mm in diameter. Due to the well-designed drive the robot is capable of passing small obstacles as well as steep gradients. The middle of the chassis holds the rechargeable batteries respectively a battery holder that receives six AA-sized batteries. The robot mainboard is fastened with 4 bolts to the upper side of the chassis and does not normally have to be removed when operating with rechargeable batteries. Two independently controllable electric motors ensure highest mobility of the chassis. The speed and direction of each track is freely controllable. Multifunction Robby RP-5 Robot chassis.comes with rubber tracks. This chassis is complete but does not include any electronics. 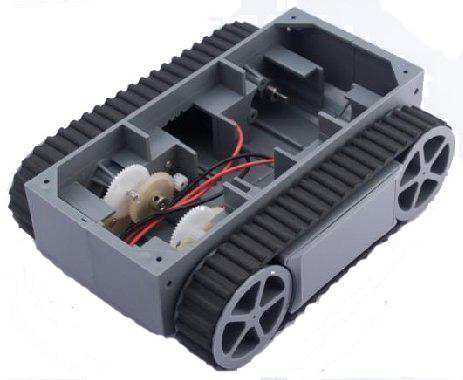 Get Tank RP5 Chassis (SKU:ROB0007) from DFRobot Store or DFRobot Distributor.